President John F Kennedy openly admired Nazi Germany when he toured the country as a young man, according to a new book marking the 50th anniversary of his historic 1963 visit to Cold War West Berlin. The views once held by one of America’s most esteemed presidents, who won the city’s heart in 1963 when he declared “Ich bin ein Berliner”, are recorded in diaries and letters Kennedy wrote on three visits to Germany in 1937, 1939 and 1945. The book, John F Kennedy among the Germans, suggests that in the late 1930s Kennedy, who was a student in his twenties, accepted Nazi race theories and approved of fascist rule. A fortnight earlier, Kennedy, who was touring with his friend Lem Billings, wrote in his diary: “I have come to the conclusion that fascism is right for Germany and Italy. What are the evils of fascism compared to communism?” Billings later recalled that Kennedy was “completely consumed by his interest for the Hitler movement” during their trip. President Roosevelt sacked Kennedy Snr in 1940 after he remarked during the Battle of Britain that “democracy is finished in England” and sought to negotiate with Hitler to prevent America entering the Second World War. But even after Germany’s defeat in 1945, when the Holocaust was common knowledge, JFK appears to have retained an extraordinary fascination for Hitler. By then a naval officer he accompanied the US Secretary of the Navy, James Forrestal, on a tour of Germany that August. Oliver Ulbrich, the publisher of the diary excerpts, said he did not believe Kennedy admired Hitler, but was rather fascinated by him. 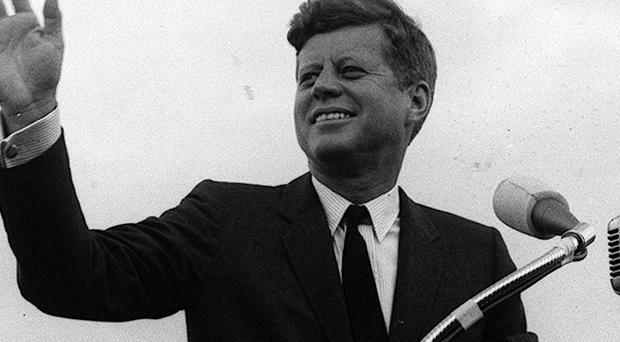 “Kennedy was trying to understand the fascination that was still surrounding Hitler,” he said. But by 1945, Kennedy was clearly put off by the defeated Germans and their total acceptance of authority. “It shows just how easy it would be to seize power in Germany,” he wrote after a 1945 visit to a U-boat building yard.